Gen. Jay Raymond, Air Force Space Command commander, speaks at the Air Force Information Technology and Cyberpower Conference in Montgomery, Ala.
"We are at the war fighter table. We are not in the cheap seats anymore," said Maj. Gen. Joseph Guastella Jr., director of integrated air, space, cyberspace and intelligence, surveillance and reconnaissance operations at Air Force Space Command. The Air Force is now staging "Space Flag" war rehearsals in virtual-reality simulations. Satellite technicians who operate communications, missile warning and navigation constellations are challenged to respond to enemy attempts to take down U.S systems. The next Space Flag is scheduled in April. The idea is to give them "realistic training," Guastella said. "Operators have to decide: Can I maneuver my satellite and stay on mission? Or do I need to do something more drastic, come off mission and survive? What other assets out there can help me?" Bomber and fighter pilots today can train in simulators that feel like real combat, there is no such thing for space. Current space simulators were designed for a "benign environment," he said. The Air Force has requested funds in the Pentagon's 2018 and 2019 budgets for systems that simulate contested space environments. The Shriever games give Space Command an opportunity to "fast forward five to 10 years, look at future capabilities that we're looking at buying," Guastella said. Officials want to "determine the relative value" of next-generation systems and "what really helps operators." 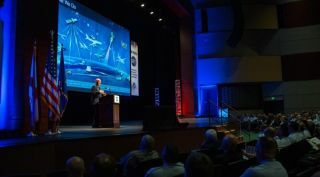 Space and intelligence operators are the primary target audience for Space Flag and the Shriever games, but increasingly the events are aimed at "big decision makers" who are in charge of budgets and policy but don't necessarily grasp the space world. Another shift at Space Command has been the addition of intelligence officers and analysts. Foreign powers threatening satellites are a relatively new concern for the United States. As space forces take on war fighting and deterrence roles, they need better intelligence, Guastella said. "We have increased the intelligence manning across the command, from the squadron level, the group level, the wing level," he noted. "We are baking in the importance of intelligence into the space force." A cadre of intelligence experts dedicated to space is "here to stay," Guastella said. "We'll build intelligence professionals that are steeped in space." One of Space Command's missions, "space situational awareness," also will change, Guastella said. "We'll be paying less attention to benign objects and more attention to objects that may be adversarial," he said. "I'm really confident that with what we're doing in intelligence and space situational awareness, we are making a huge difference." Some officials have argued that current military satellites are attractive targets to enemies because of the their huge size and price tags. There is a push to transition to more resilient systems such as large constellations of small satellites. Guastella did not want to take sides on the matter. "Everything is on the table," he said. The space force for now assumes that existing systems will be around for the foreseeable future. "We have the cards that we're dealt with right now," he said. "A lot of those cards we're going to have for a significant amount of time. But we're going to work to protect what we have." Guastella suggested that there is nothing particularly unusual about enemies threatening the United State with some new technology. "Bad guys come up with new widgets. We figure out a way to change our tactics, techniques and procedures." There is a growing focus, however, on "what we build into the future," Guastella said. Unlike other generals who complain about the military's plodding procurement system, Guastella would not offer an opinion on the issue. "I've never seen a military commander that doesn't want stuff sooner. It's in our nature. Space is no different," he said. "The demand signal is off the charts." He cautioned against rushing off to buy new systems, though. "These are important decisions. It's important we take our time. We need to move out, but we need to move out smartly." Meanwhile, "we are finding our way to fight with what we have right now." Guastella also declined to weigh in on the escalating feud between the Air Force and leaders of the House Armed Services Committee over the congressional push to create a separate space corps. "The fact that we're thinking and talking about this is interesting.